In terms of historical dishes, few can compare to the presence of Peking Duck. Dating back to the Yuan Dynasty (approximately 1271-1368), Peking Duck is a dish rich in history, tradition and most importantly, flavor. The Pekin duck breed was introduced to America by China in the 1870’s. While beginning in Connecticut, Pekin breeders eventually traveled on to Long Island, where by 1960 Long Island duck farms were producing nearly 7.5 million ducks per year. The ducks at Momosan are locally sourced from the last remaining duck farm in Long Island, Crescent Duck Farm. The once booming industry was in recent years burdened by strict land regulations and skyrocketing real estate prices. Crescent Duck Farm is still breeding nearly one million ducks per year. The process that one must undergo to transform these ducks into the dish diners are familiar with is one that takes a great amount of time and effort. The process at Momosan begins by cleaning out the cavity and seasoning the inside of the duck with a mixture of salt and spices, including five spice, star anise, bay leaves, shallot, hoisin and scallions. After seasoning, the belly of the ducks are sewn back together with a long skewer. The ducks are then blanched in boiling water, helping to dry out the skin. After being blanched, the ducks are basted with a mixture of maltose/red vinegar, helping them to pick up color, as well as adding a slight sweetness to the skin. The next step is to hang the ducks in the walk in cooler for at least 24 hours. The cold air dries out the skin, leading to an even golden brown skin once the ducks are roasted in the oven. Since the bellies were sewn shut, the spices inside the cavity are able to permeate the ducks from the inside out and keep the juices inside, allowing the meat to remain moist. After roasting, the ducks are finished in the fryer, leaving the outer layer extremely crispy. The final dish is composed of sliced duck, delicately and precisely sliced so that both meat and skin are included, then layered inside of a crispy gyoza skin (a contrast to the traditional flour tortilla). 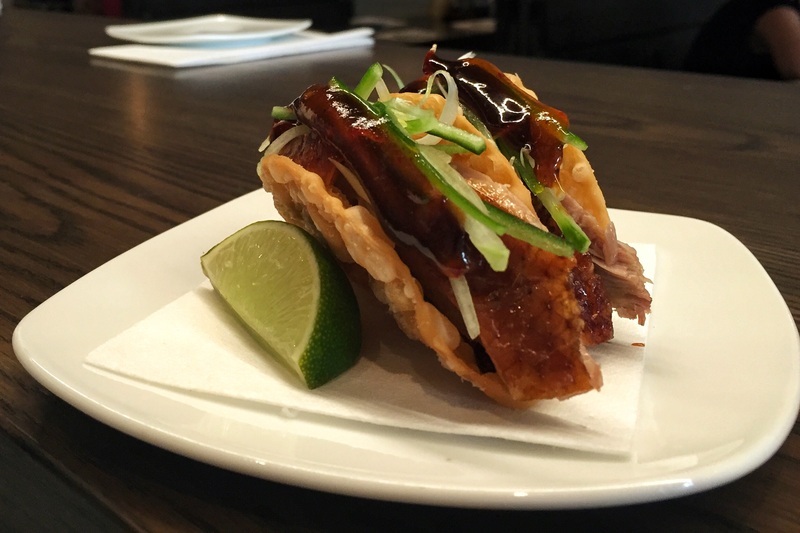 The “taco” is also filled with traditional accompaniments such as cucumber, hoisin sauce and an apricot sweet chili sauce.